LOVE. After obsessing about the ps11 for over two year I finally caved and bought it. 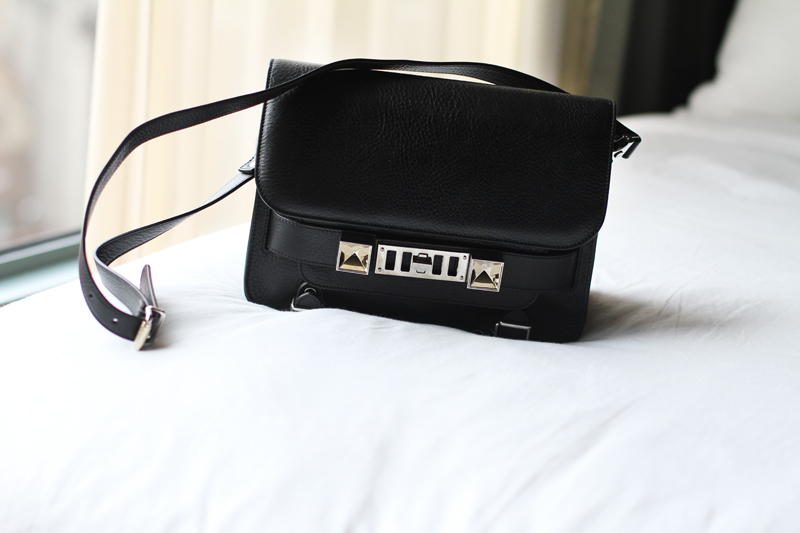 Now I’m not sure if I’ll ever wear my other bags again, this truly is the perfect black bag! This entry was posted in Fashion and tagged black bag, Proenza Schouler, ps11 by Carolina Engman. Bookmark the permalink. i couldn’t be more jealous right now. congrats, most amazing bag right now!!! It is such a beauty!!! The perfect bag!! I agree with you, dear. If I were you I would never wear other bag again, this is pure art. lucky you!! I love this bag!! Amazing bag – very modern and sophisticated. This is such a beautiful little bag! I really like it in black, you’re right, it IS the perfect little black bag. I think everybody will understand if the upcoming twenty outfit posts are accompanied by this bag :) and we will enjoy seeing it! What a beautiful bag… love it!! It is the perfect black bag. Jealousy is what I’m feelin’! ahhh im in love with this bag! so cute! i want a ps11 so bad! Officially drooling over here….so gorgeous <3!! Also called the perfect bag! In black is so stylish and chic! Easy to wear with anything! I’m in love! Gorgeous! I thought you would cave for the gold bag! I agree. Perfect black bag! Ah I am obsessed with this bag. Perfect shoulder bag! Wow what a perfect purse!! I could wear that with everything… onto the wishlist it goes! LOVE your bag – so jealous! WOW so nice ! So glade that you finally got it ! Enjoy it ! Jep! It is the perfect bag. It’s amazing,luky you…can’t wait to see this beauty in your outfits! Love love love it!! It’s such an amazing bag and I’ve been lusting after one as well. Congrats!!! Oh my god, I love that bag! Check out my blog at http://alltochlitethea.blogspot.com/ for inspiration, fashion and much more! My blog is a inspirational blog, with quotes, pretty photography and subtile influences from my own life. Hope I will have the opportunity to inspire you young women to find motivation in life, raise your ambitions and fulfill your dreams! PS11, such a good choice! I love it, it’s such a beautiful bag! OH MY GOD this bag is perfection!! Dman I love that bag!! Wow, I can’t find words over how exclusive that bag is. You did the right thing buying it! Looks amazing, love that one! It’s beautiful! Congratulations on your new LOVE! That’s a great shoulder bag. Ayayay such a beauty! Simply perfect! Really love this look sooo much, I know I said it already, but really wow! Oh, do check out my take on a Neo-Amish look, a potential pre-LFW ensemble? Oeh that bag is amazing indeed, totally love it!